Bennett’s Honey Farm is Santa Clarita’s only locally sourced one stop shop for everything honey related. Their honey is produced in Ventura County, which is home to the best sage and wildflower fields in all of California. Bennett’s Honey Farm is a family owned operation. It was founded by Red & Ann Bennett and is currently owned by Chip & Taydee Vannoy. They produce, pack and distribute all of their own honey in their 100% solar powered green facility while proudly maintaining industry standards for cleanliness and safety. Instead of filtering their honey, they use a process called “gravity straining” which allows the honey to retain its natural perfect components. This process takes a little longer but doing so is necessary to provide the highest quality honey available. Bennett’s Honey Farm has four, 1,000 gallon tanks that hold the honey after it is extracted, and is then stored in food grade safe containers. With declining bee populations in mind, Bennett’s Honey Farm takes great care to provide a healthy and beneficial environment for the bees. Along with their kosher and organic honey, raw honeycomb, honey sticks and royal jelly capsules, they offer a vast selection of honey products including honey bbq sauce and beeswax beauty products and candles. They offer natural, safe and homemade beeswax lotions, lip balms, rejuvenating rub and muscle rub. Santa Clarita residents flock to Bennett’s Honey Farm to help get locally sourced honey and pollen to aid in allergies throughout the year. If you’re allergic to pollen, some people believe ingesting it slowly may aid your body in overcoming your allergy to local plants. According to Bennett’s Honey Farm, a great number of tests with pollen have been made by doctors on children and adults to define its remarkable action on man. Many claim it as a natural energy booster that also combats nervousness and fatigue. Many people believe pollen can improve eyesight because it contains retinol and riboflavin. Some Santa Clarita residents claim pollen is good for your skin as it rids the body of wastes, bringing in vitamins, free amino acids and biotin. 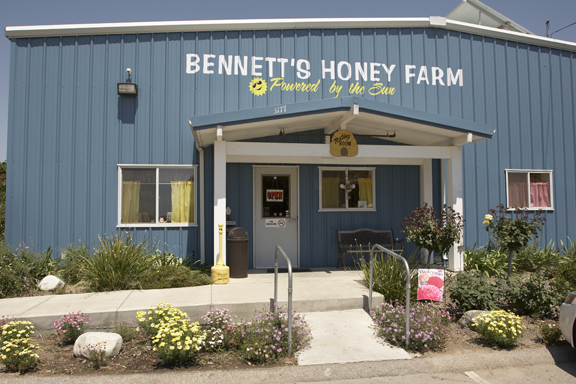 To learn more about Bennett’s Honey Farm click here.